I received produce from Melissa's for recipe development in conjunction with #FabulousFallBounty. All opinions are honest and my own. This butternut risotto is the perfect fall comfort food. It is fancy enough for a dinner party but is all the creamy, comforting goodness you want it to be. 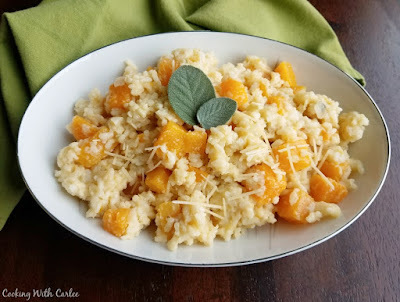 I have been craving a good risotto ever since the weather cooled down. There is just something about the creamy hearty goodness that just makes you feel better. It is so comforting and I just love the feelings it evokes. So I picked up one of those big tubs of arborio rice a few weeks back. I had mushroom risotto on the brain and I was excited to make it. Then I accidentally put all of the mushrooms in another dish before I had a chance to make the risotto. Don't worry, I will rectify that soon enough! In the meantime I figured it would be fun to try something else. So I went to town on prepping the butternut squash and shallots I got in my big box of produce love from Melissa's. Of course a couple of cloves of garlic got wrangled into the pot with some butter as well. Let me tell you, if the smell of all that goodness cooking in the butter doesn't draw you in... well I'm just not sure there's hope for you. (Kidding, but seriously it is heavenly!) It had me excited to get to the finished product! Once the onions and shallots are soft you add the rice and let it toast for a bit. Meanwhile make sure your broth or stock is hot, ready and waiting. At first it will seem like the ratio of veggies to rice is skewed too far towards the veggies but don't you worry, that will soon change. Once the rice is hot and starts getting a little translucent around the edges add your wine. Don't skip the wine, it adds such a good flavor in the finished product! After that it's just a matter of adding a ladle of hot broth at a time and stirring the bageebers (that's the technical term) out of it until the liquid is almost all absorbed and then adding a bit more and repeating the process until the rice is how you like it. Finishing with a bit of butter and Parmesan never hurt a thing, so go ahead and stir that in at the end. The process is a bit of work bit it's certainly not hard. Besides you will have worked up a nice hunger from all of the stirring and the smells will keep you sustained until it's time to eat. This would make a perfect side dish for a dinner party or your holiday table. Honesty I'd be happy with a nice big bowl for diner! 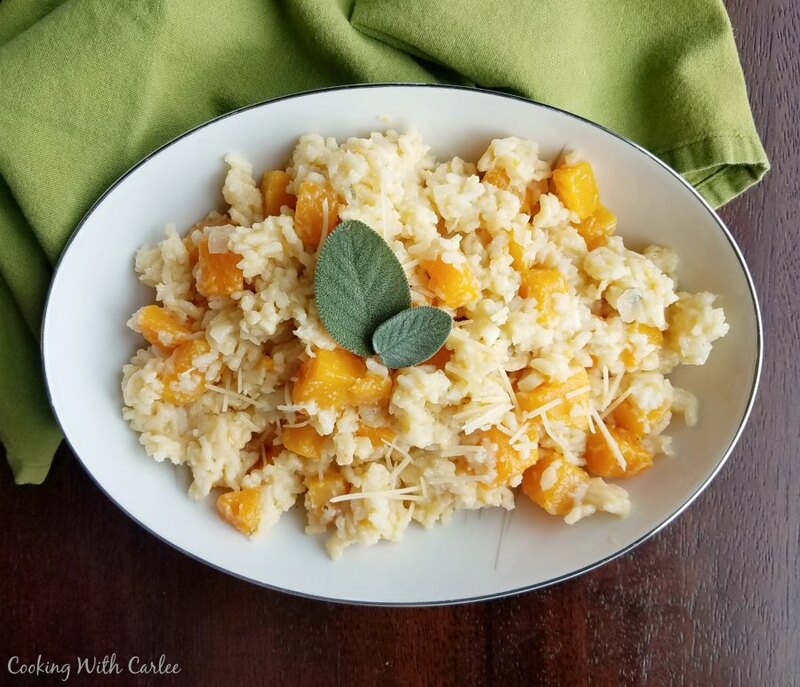 Have you ever had a risotto that knocked your socks off? What are your favorite flavors for risotto? Heat up the chicken stock to a simmer and hold over medium low heat. Peel and chop the shallots and garlic. 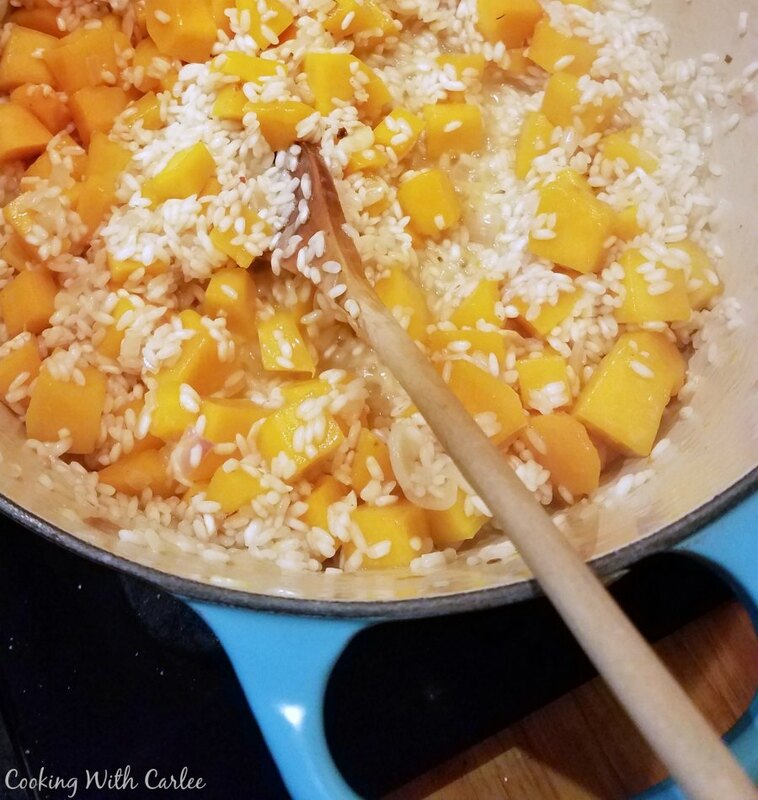 Remove the seeds and peel from the butternut squash and cut into bite sized cubes. In a separate large pot, melt 2 T butter. 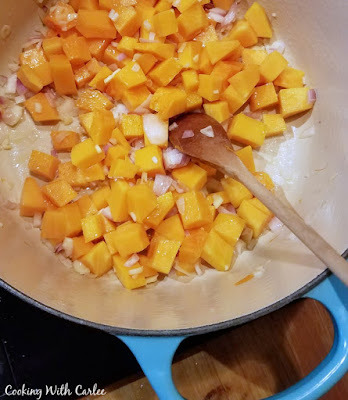 Add the shallots, garlic, red pepper flakes and butternut squash. Cook over medium heat until the shallots are translucent and the garlic is fragrant. Add the rice and toast until the edges become translucent. Be sure to stir frequently. You don't want it to take on color, just toast a bit. Pour in the wine. Cook and stir until the wine is almost all absorbed. Add the sage and a ladle full of hot chicken stock. Stir until that liquid is absorbed. Add another ladle of hot chicken stock and stir until it is absorbed. Continue until the rice is cooked to your liking. Once the rice is soft and creamy and you are satisfied with the texture, remove from the heat. Stir in the finishing butter (2 T) and Parmesan cheese. Adjust the salt and pepper to your taste and serve. 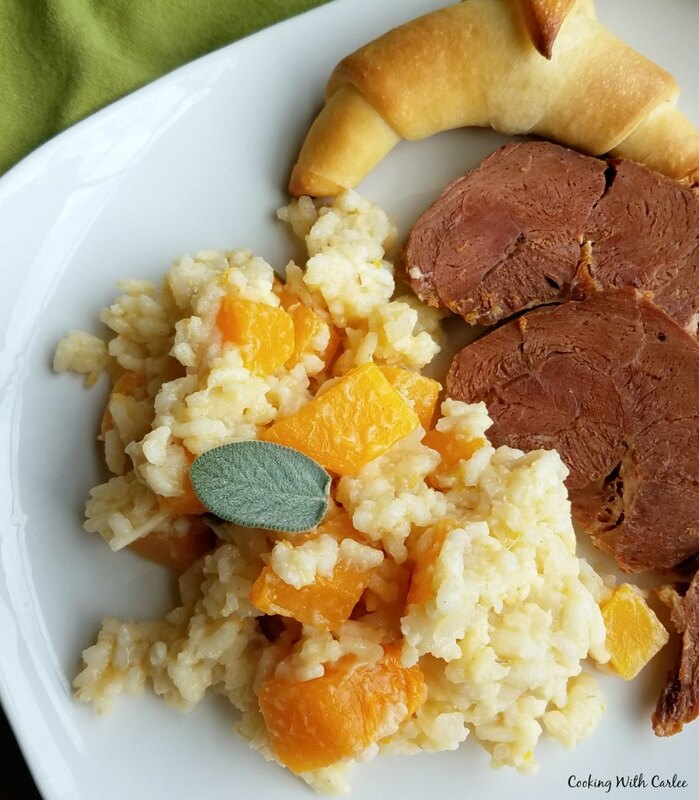 It was so creamy and had those wonderful tastes of thanksgiving with the squash and sage. Mmm! Thank you! There is something so soothing to me about making risotto. It gives me calm and comfort both while cooking and while eating. I kind of like it too, as long as I have the time to focus on it. Soooo good! Thanks, Wendy! I love this idea! 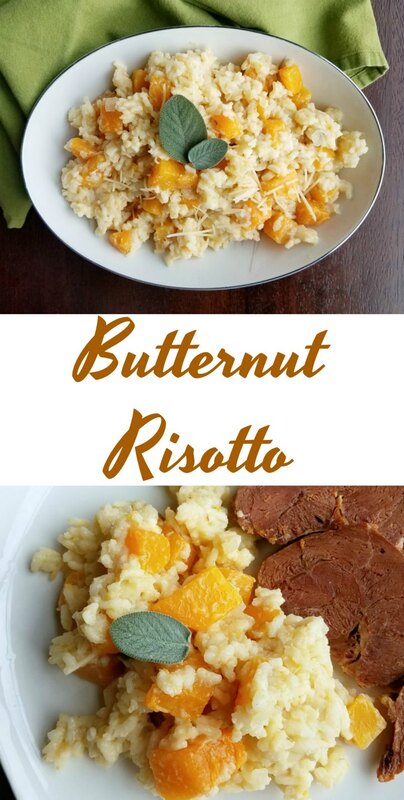 I would never have thought to put butternut squash in risotto but I'm sure I'll love it! The textures and flavors really work so well together. This looks fantastic. I've eaten risotto but never made it at home. Time to change that!